It’s that time! Yes, indeed. Time to get those gifts dressed up to the nines and pretty as petunias. Now, there’s no need to go out and spend good money on fancy papers or frilly bows! Goodness no. People will be ripping this stuff to shreds. No, what you do is head on over to your friendly household recycling bin, grab some of that Christmas flavoured junk mail and follow me! Let’s do this thing. Time’s a wastin’! 2. 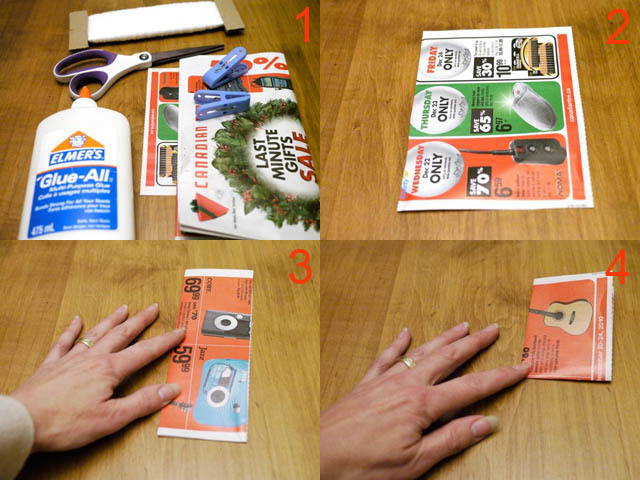 Cut out 2 rectangular pieces of junk mail of the exact same size. Take one of these. 3. Fold in half lengthwise. 4. 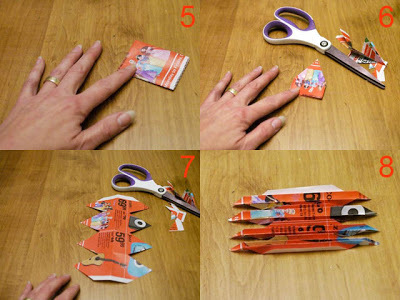 Fold up in quarters. 5. Fold up in eighths. 6. Make 2 cuts starting from the raw edge and diagonally toward the center fold. 7. Unfold the piece. It should look as mine does in #7. 8. Fold up like an accordion. 9. Pinch the accordion in the middle. 11. Tie a piece of string around your accordion at the half-way point. 12. Fan out one edge of the accordion towards the other edge. This creates a half flower. Glue the two edges together. Use a clamp to hold it in place. Repeat steps 1 through 12 with the second piece of junk mail. These two halves glued together create the full flower. 13. Once you’ve glued both halves together, flatten the petals out between your fingers. 14. This way the petals will stay open. 15. Create a little coil of paper with a folded strip of junk mail. 16. 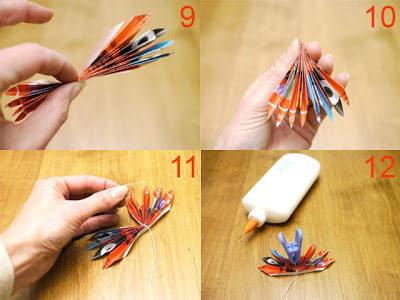 Fasten the coil with glue to the center of your flower bow. And you are done! 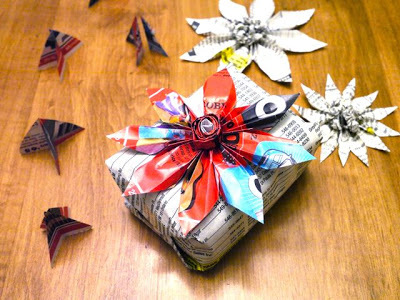 Attach junk mail bow to the gift! Quick. Pretty. And the price ain’t bad either. Here’s a white poinsettia I made with telephone book pages. 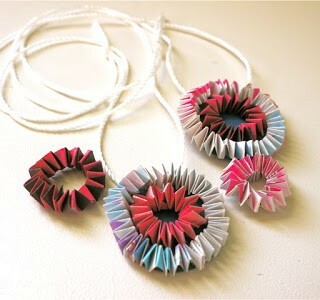 For the center, I balled up some little pieces and glued them to a tiny circle of paper. Once dry, I glued this circle to the flower (or leaves, for you poinsettia purists) center. If you don’t want your gift recipient to rip up your beautiful handiwork, attach a little piece of gold cord to the bow and tell them it doubles as a Christmas ornament! See, now you’re thinking of all the angles. And please, have yourself a lovely day! What a brilliant idea. So effective. You are just the most creative person! These are adorable! Cool! I love the one with the telephone pages! Super idea! Very pretty. It is amazing the effect you can get from just white junk mail. They are beautiful! I love the telephone pages one in particular. I love the bow with the little paper balls in the middle! 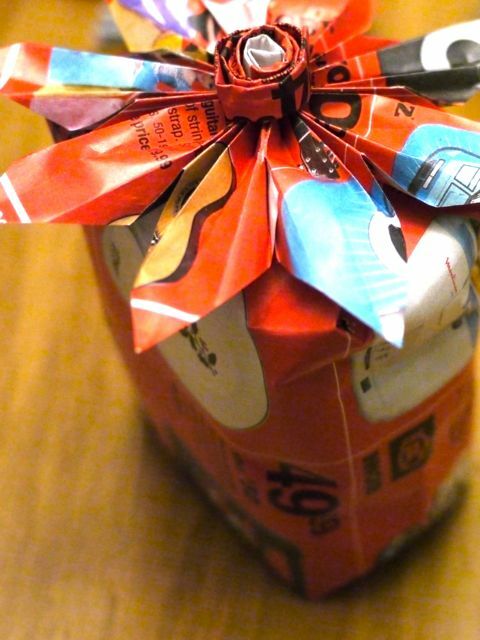 I also think that the wrapping is one of the best things at christmas! Especially if it is special! So pretty! Mine look more like the plain newspaper-no fanciness. 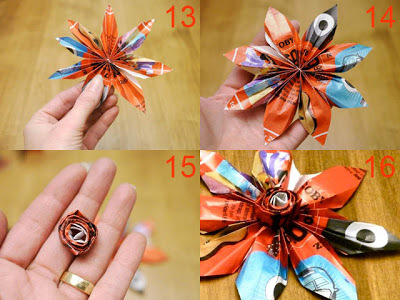 I have to try some if I get my act together and start wrapping! 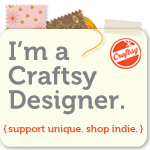 I especially like the white one, but it is TOO nice for my non-crafty friends and family. I love these! I think I need to get more fancy with my wrapping this year so I can try these. Oh, wow, these are so pretty. The tiny balls on the poinsettias are just the coolest! BAH, how did I miss this?! 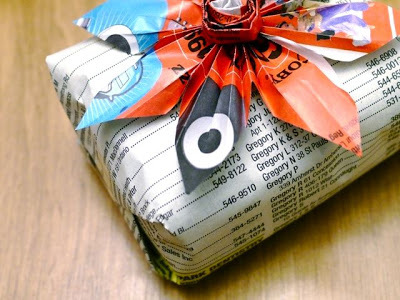 This very morning I needed to wrap a last minute gift for a holiday lunch (zero materials on hand)…this would have been great. Grr…next time! And they really do look like poinsettias, too! These flower bows are so cute – I love them. I always love finding new ideas that re-use. 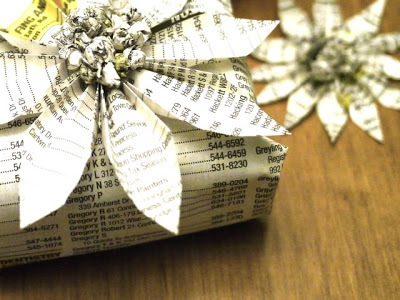 I have wrapped with pages from the phone book, but never made a flower. So pretty with the bling in the center. Great idea Michele! 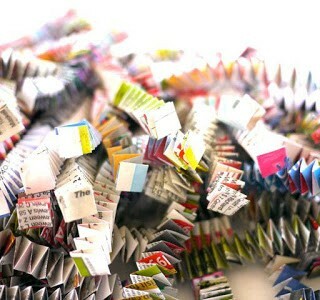 I specially like the look of the phone book pages. Happy new year! 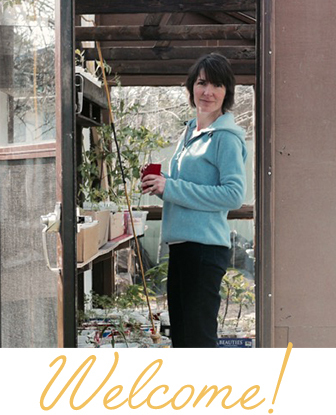 Thank you for this tutorial and thank you for posting a comment to my blog! 🙂 I used staples instead of string and glue, that way it took only 2 minutes to make one flower. 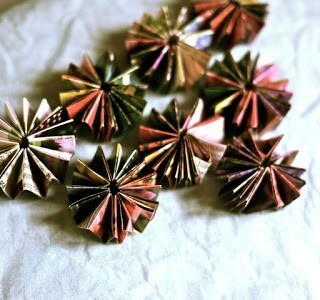 I've already made some garlands with those flowers, I'll be posting about them soon in my blog. Just genius & oh so pretty! Great idea! I particularly like the phone book idea. I'm pinning this. THANK YOU FOR SHARING! This is brilliant. Got to you via a convoluted detour on Pintrest. Glad I found you!!!! Stunning and such a great idea! I put a link on my blog because I like to share such brilliance. Ooooh, it's so simple and pretty really love it.